The Mission of Catholic Schools in the Rockford Diocese is to ensure that the person of Jesus Christ is proclaimed, learned, experienced and lived by students in their homes, their classrooms, their parishes, and in their communities at large. We pursue the development of the whole child through spiritual, academic, and physical formation; working together with parents, clergy, and parish communities. The ultimate goal of the educational process is to form dynamic, responsible and service-oriented adult Catholics who participate fully in the sacramental life of the Church and are empowered by their love for God and desire for eternal salvation. Pope Saint John Paul II Catholic Academy, in partnership with the parents, strives to enrich the lives of our greater community through prayer, academics and service. Following the traditions and teachings of our faith we are called to emulate a life of spirituality. The administrators, teachers, and support staff recognize the dignity of all children and embrace their uniqueness in learning. We take responsibility to offer an education that will provide opportunities for each child to grow spiritually, morally, intellectually, socially, emotionally and physically. Our students will acquire skills they can use with confidence and competence to continue learning and serving throughout their lives. As the students are empowered in their role as members of our faith community and of our diverse society, they will be responsible in their decision making and in their actions. They will demonstrate respect for all God’s creation. They will be resourceful in promoting justice and peace in their relationships and activities. Strengthening Catholic Education in the Diocese of Rockford was and is the goal of the Faith Forward Strategic Planning process for schools, begun over two years ago all over the 11-county diocese. Finding solutions to maintain the high quality of Catholic education in schools around the diocese, and to do so in a cost-effective way for parishes and parents, was the goal identified in the plan. Some Aurora area Catholic schools have found a creative solution to meet that goal. The Diocese of Rockford, with the Aurora Task Force Committee, announced Jan. 29, the creation of a new school, Pope St. John Paul II Catholic Academy, starting in the 2018–19 school year. The new school is being created by the combining of four Aurora schools; Our Lady of Good Counsel, St. Joseph, St. Peter and St. Therese of Jesus Schools. the Pope St. John Paul II Catholic Academy will be located on have two campuses, a north campus at St. Joseph parish and a south campus at Our Lady of Good Counsel parish. The decision is a result of the Faith Forward Strategic Plan, which outlines objectives and goals to strengthen Catholic education throughout its 11-county region. Financial and spiritual support of the new school will come from seven Aurora area parishes including Our Lady of Good Counsel, St. Joseph, St. Therese of Jesus, St. Peter, Sacred Heart, St. Nicholas and St. Mary’s. “We are excited about the collaboration between these seven parishes in Aurora and the opportunity to build the best Catholic educational experience for our students,” said Michael Kagan, superintendent of schools for the Catholic Diocese of Rockford. The Rockford Diocese has not been immune from the issues facing so many Catholic dioceses and private schools in Illinois which include declining enrollments due in part to declining overall population, and declining Catholic populations and a duplication of services in some areas. The Aurora Task Force Committee, which includes pastors, principals, Parish Council, Education Commission and parish and school Finance Council members, has been meeting since early June, 2017 to develop a plan for a thriving Catholic education program on the southeast side of Aurora. The decision choosing the two campuses was made after a thoughtful process which included facility assessments of all four schools to evaluate the ideal locations based on size, structure, current and anticipated maintenance needs, amenities like spacious gymnasiums and other variables. The school’s name, Pope St. John Paul II Catholic Academy, is a reflection of what the new school will represent. 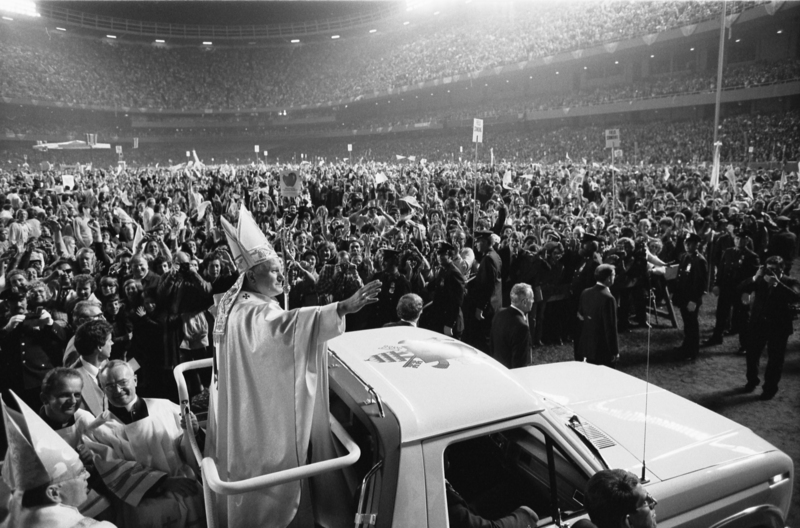 Pope St. John Paul II was a great supporter of Catholic education who traveled to more countries (especially Spanish speaking countries) during his years as pope than any of his predecessors. The school will prepare students for faith-filled lives of purpose by offering a global curriculum that integrates new learning technologies and focuses on teaching students to identify and solve real-world problems with collaboration, critical thinking, communication and creativity. “While we recognize this announcement may be a difficult change, it should also be seen as an exciting new chapter. Closing schools is an all too-easy solution. Being creative and building for the future takes time, effort and vision. People in Aurora can take pride in the way they have chosen to come together and meet the challenges not just for today for the future as well,” Kagan said. From The Observer, “Pope St. John Paul II Catholic Academy to Open in Aurora for 2018-19 School Year New School Result of Ongoing Strategic Planning” (1 February 2018). Catholic Schools . . . Prepare students to encounter Jesus Christ and bring Catholic teachings into their lives and the lives of those around them. Reinforce faith and values taught at home by continuing their practice every day in school and co-curricular activities. Strive to foster student’s lifelong commitment of Christ-centered service to others. Teach knowledge and skills that enable students to function well as citizens in a changing technological and multicultural society. Use a whole-child approach fostering intellectual, spiritual, physical, and social development. Employ a curriculum based on national, state, and diocesan standards. Find that a majority of their students consistently score above average on standardized tests. Are equipped with computers, smart boards and other cutting edge hardware. Integrate the use of technology into the various subject areas. Provide instruction in the ethical and safe use of the internet and other technology. Teach respect and dignity of self and others. Administer discipline in Christ-like manner. Offer an education that is personal; teachers know their students as individuals, their various learning styles, their strengths and limitations, and what motivates them. Cultivate an environment in which children can discuss and live a value-based life. Invite and encourage families to be involved in the school. 96% of Catholic school graduates go on to further their education at some of the best colleges and universities in the country. Catholic education is one of the most important investments a parent can make to ensure the success of a child’s life in this world and for eternity. Students in Catholic schools experience a culture of service which carries over into their adult lives often benefiting local, national and even global communities. Many parents choose Catholic schools for their children because of superior academics. The longer a student stays in Catholic schools, the greater is their achievement. Catholic school students are encouraged to question, to accept challenges, to make choices and to assume leadership roles. Catholic schools educate the whole child, emphasizing faith, academic achievement, self discipline, and high moral standards. Catholic schools make a positive difference in the lives of their students. These schools are communities of hope which reflect God’s love and love of neighbor.